I’ll need to develop this page a bit more with pictures but for now I’ll try to paint a picture for you with my writing. Our house was originally built sometime around the 1880’s. There have been four to five additions since that time. The most recent in 1999 or 2000. We had been in our house about a year when we began our own renovations. While repairing the baby’s room (Pickle) we found that the floors were insulated sometime in the 1950’s. 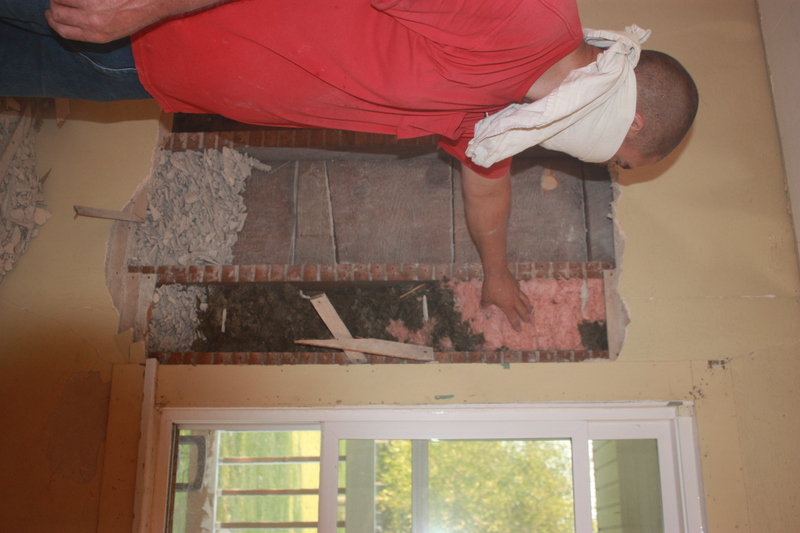 We know this because the insulation used was newspapers. It was a remarkable discovery and there began our magical discoveries all over the home. One of the newspaper articles talked about the first round Baler every made. Amazing! From the babies room we conquered the kitchen & dining room areas. This was when Pickle was about 9 months old. I was so excited when they tore down the ceiling and we found that our roof was held together by logs. Very neat! 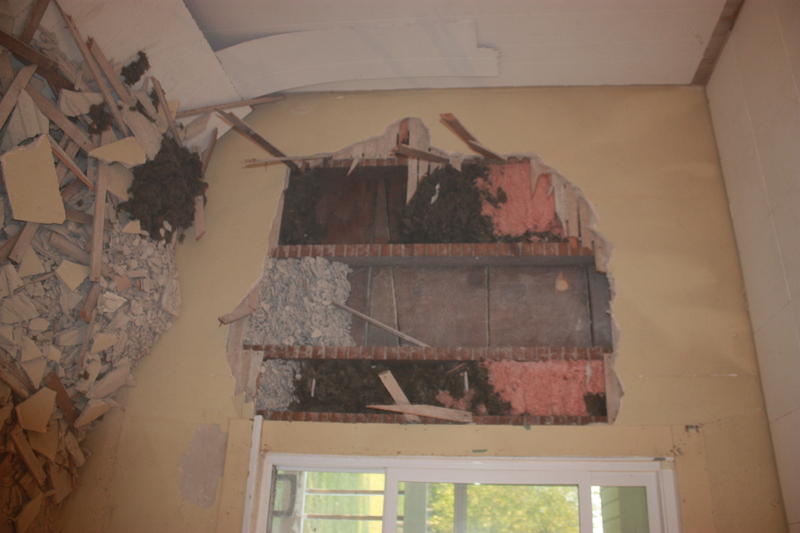 The transformation of the kitchen and dining room included knocking down a portion of the wall connecting the family room, dining room and kitchen areas. One of my favorite parts of that renovation is the dining room floor. We were wanting sometime unique & hardwood floors were really out of our budget (the real deal not the laminate). My ingenious husband went to his parents farm and found some boards that had at one time been part of the corn crib. The end result was a beautiful floor from a part of our four generation farm. We then built a bathroom into the mudroom…which I really appreciated while I was pregnant with Willis and following the delivery. There are 14 steep stairs to the second floor. Our most current projects which are sadly still in progress are giving the upstairs bathroom a face lift with a little paint and the stairs. Due to Willis’ allergies and asthma we removed the carpet from the stairs and initially planned on sanding and refinishing the wood. Unfortunately, many of the steps were cracked and the entire staircase had to be replaced. He stained it a beautiful mahogany. Now I need to finish things up with some paint on the walls. I’ll add it to my to-do list. The last year has really been spent working on the outside…but you can read about that In the BarnYard. We have always had the three boys share a room and I’ve never heard one complaint. The enjoy being together however, the room is only wide enough for a twin bed and approximately 12ft. in length. It’s not designed to house fit 3 boy with all of their things. As parents, we’ve been facing three major problems. The first is accountability. We can not hold Pickle and Willis accountable for keeping their room clean. In less than 2 minutes, Pudder can make the room look like a twister went through. The idea came about to stop using the smallest room in the house as their toy room, divide the toys up between a room which Pickle and Willis will share and their old bedroom. The room they would be moving into was our storage room and my office. We had to fit everything in that room into a room 1/2 the size. Second, the three boys would giggle and sneak out of bed for the 30 min. after I tuck them into bed. With a 6am wake-up call you can imagine the older boys were becoming very cranky. The third is the bunk bed. Pudder is a climber and first climbed the ladder of the bunk bed when he was about 14 months old. He continues to do so. We’ve only had one major fall but it makes me nervous. The solution was to gut and re-build the ex-storage room/Pickle and Willis’ new bed room. Here are the pictures I took from the beginning of the project until today. My hubby is pointing out the areas where someone attempted to blow in insulation. Note the boards on the opposite side of the 2x4's. This was the first picture I took. The wall you are looking at was previously covered in white paneling. He ripped it off and started into the gutting in this corner. As the renovation progressed we still hadn't found anything of interest. On all other renovations we've found something remarkable. It was when we opened up this wall we found this doorway which previously led into the family. 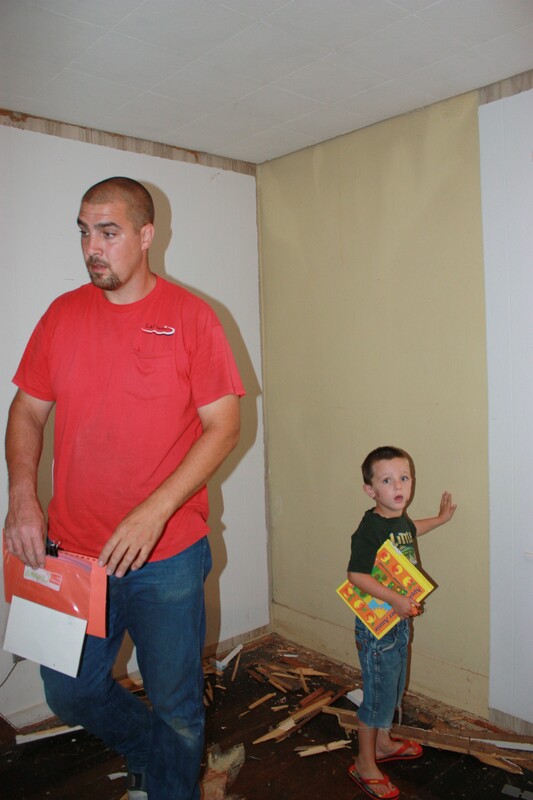 Due to Willis' allergies and asthma drywall was immediately put up as the area was gutted. This was the first piece of drywall. Eventually, the drywall was finished, then the taping and texturing which helps to disguise blemishes you tend to see in older homes. Finally, the boys made a decision on a paint color and away my hubby went with the painting. I was allowed to help…I sort of have a problem painting. When we first moved into the house my sister-in-laws were helping me paint the kitchen and they fired me from helping I was doing such a poor job. True story! Following the painting the floor was laid and we moved in furniture. That was the night before the Cub Scout camp out. What will we tackle next? Our bedroom has been asking for a new look for years. It’s more than painting. 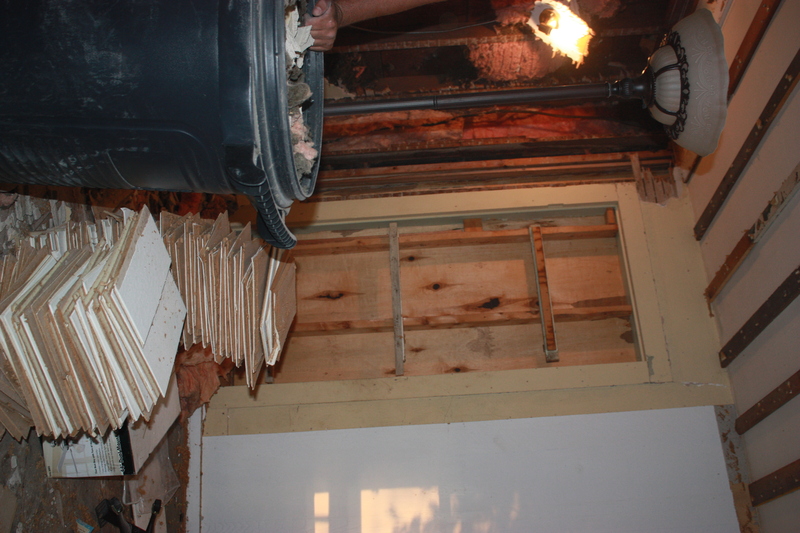 We need to level the floor, gut the walls and re-insulate. Then drywall, painting and laying the floor. After that I would really like to paint in the family and mud rooms. Stay tuned as we continue our search for treasures in The Magic Farmhouse! !